I record video from this moment, and before the first attempt to enter the account. Seller will give you a gift certificate in the amount of 11,9179 RUB for a positive review of the product purchased. 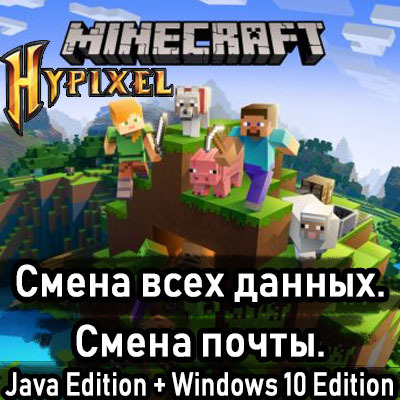 This is a fully licensed Mojang account with Minecraft Premium (Java Edition) with access to mail. You can change absolutely all the data. Access to the server "Hypixel" is guaranteed! • Recover an account if the attackers stole it or you simply forgot your password. This purchase will be equivalent to the purchase of the official key which costs $26.95. There are no bans on the servers! On all accounts, the password changed 5-7 years ago. For each Minecraft Premium account, a new mail was registered, which can be pre-secured as securely as possible (link your phone, connect two-step authentication, change passwords, etc.) or change mail to yours. Amazing seller, all accounts are working I have purchased many times from him for all of my friends all of his accounts are HQ and active. Seller will give you a gift certificate in the amount of 11,9179 RUB for a positive review of the product purchased.. STEAM SUPER ULTRA ELITE KEY / Original №1 ?